The Fort Lewis College Aquatics Center was originally built as a gymnasium in 1956 and was remodeled to its current configuration as an Aquatics Center in 1974. The building is 26,000 sq. ft. with the single largest area of the building being the natatorium. Within the natatorium is a 5,400 sq. ft. pool and an elevated spectator area. The pool is “L” shaped and is comprised of two distinct but connected areas; the competitive swimming pool with six 25-yard lanes and a large diving well. 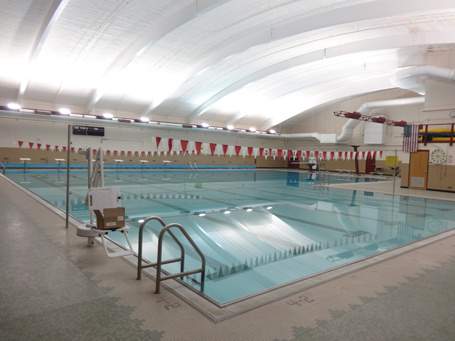 In 2012, the team of Counsilman-Hunsaker, RMBA Architects, and Beaudin-Ganze Consulting Engineers completed a facility audit which included an evaluation of the existing 25-yard pool, all mechanical systems, and provided cost estimates for renovation and/or replacement. After the decision was made to renovate, estimates were given to repair the 40-year old pool for long-term use. After the audit phase, Counsilman-Hunsaker was retained to conduct the following repairs/renovations; bringing the facility up to current code compliance.